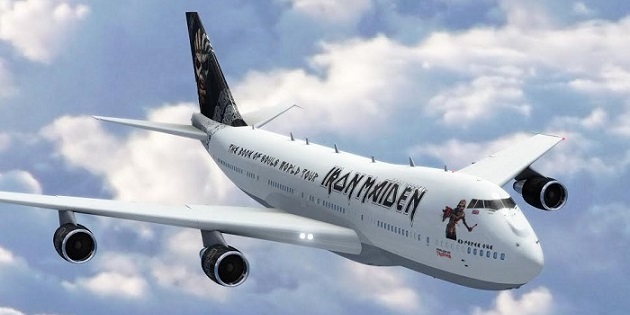 Iron Maiden, whose new studio album The Book of Souls, their first for 5 years, will be released worldwide next week on Sept 4, are taking touring to a new level using a Boeing 747-400 Jumbo Jet (aka Queen of the Skies) for their World Tour next year. 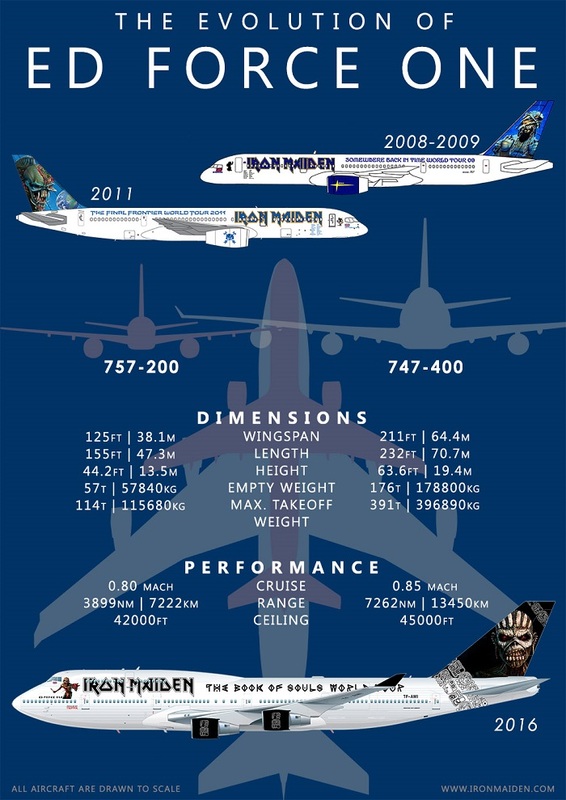 Vocalist Bruce Dickinson is currently in training for his licence to fly the massive four engine jet, which is almost twice the size and over three times the weight of the Boeing 757 used on previous tours in 2008/9/11 (see attached comparison grid). The new Ed Force One will take the band, crew and over 12 tons of equipment more than 55,000 miles (88,500km) around the planet with concerts in six of the seven continents (Australasia, Asia, North and South America, Africa and Europe) with The Book of Souls World Tour 2016 expected to visit around 35 countries. Details of the precise schedule are currently being finalised and we will commence announcements of specific dates for the different territories in a few weeks’ time. However we can reveal that The Book Of Souls World Tour will open in the U.S.A in late February with Ed Force One flying in for three shows before, in early March, heading into Central America visiting Mexico, followed by a much anticipated first ever concert in El Salvador and a return to Costa Rica. Ed Force One then proceeds into South America for concerts in Argentina, Chile and a number of shows in Brazil before flying back to the USA at the end of March for ten more cities covering the USA and, of course, Canada in the first two weeks of April. “However, even though we have worked out the logistics of taking a plane of that immense size out on tour, I still have to learn to fly it before we can go anywhere! So, I’m currently doing my training to qualify as a pilot and Captain on a Boeing 747. I’m doing this at Cardiff Aviation, my aircraft maintenance facility in Wales, where we recently took possession of a rather splendid 747 simulator which I can’t wait to get practising on! 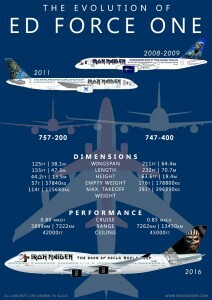 The 747 is the world’s most recognisable airliner on account of its distinctive hump. With its impressive dimensions of 70.7m (232ft) length, 19.4m (63.6ft) height and a jaw-dropping wing span of 64.4m (211ft) this double-decker aircraft has a range of 13,450km (7,262nm). Final dates, venues and ticket on sale times, along with full details of what Maiden fans can expect from The Book Of Souls World Tour, will be announced by territory starting in a few weeks’ time. As usual, where feasible, Iron Maiden Fan Club members will have exclusive access to purchase tickets before they go on general sale. Also, wherever possible, the Fan Club will again be running the First To The Barrier draw for privileged, early access to the venue to secure the best standing positions by or close to the barrier.